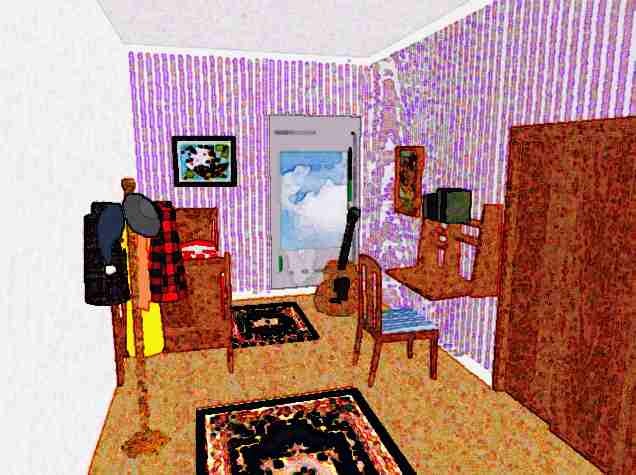 This is the second story in the Flying House series... it is still unfinished, but you can help! Your comments are welcome. "Wake up! It's time to get up!" To Christopher, who was in the middle of a wild dream, the voice seemed to come from a distance. A Surfing Space Alien was chasing him through a foaming sea of stars. "It's time to get up NOW!" Skylar's insistent voice was beginning to be annoying. Groaning, Chris tried to roll over and shut it out, but then he started to remember where he was. He turned back over and slowly opened his eyes. The face of his four-year-old brother hovered mere inches from his nose. "Nana says 'Let's eat breakfast'" Skylar announced seriously, taking his big brother's face in his hands. Then Chris remembered what had happened to Skylar just yesterday, and was suddenly thankful to see him. "All right," said Chris as the last traces of his waking irritation disappeared. Throwing back the covers, he swung his feet to the floor and looked around the sunlight-flooded room. "Go tell Nana I'm coming right down" he said. "OK" Skylar replied; then he turned and scurried out of the room. Stretching, Chris stood up, slipped out of his pajamas, and walked over to the clothstree where exchanged them for the jeans and T-shirt hanging there. Quickly he made his bed (Nana's rule!) before heading toward the door. On the way he couldn't resist lingering by the window for a peek outside. The clouds were like giant puffs of cotton, and seemed quite close. Far below, sunlight glinted off the tops of what appeared to be tiny ripples. Chris knew they were really large waves; in fact, he could see the "V"-shaped wake of a tanker some 1,500 feet below, carrying a cargo of crude from the oil fields of Texas across the Gulf. 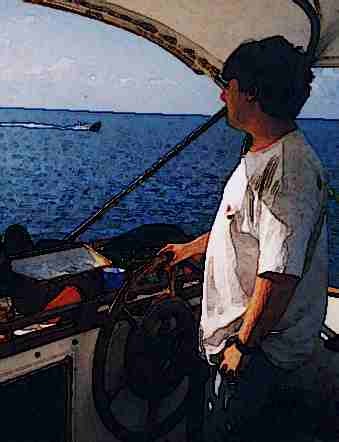 Chris tried to picture himself at the helm of the great ship, looking forward across the vast deck, eyes scanning from sea to radar screen and back to his instruments. Just then Papa's voice came over the intercom, interrupting Chris's reverie. "Breakfast is served in the garden - are you coming, Chris?". "I'll be right there, Grandpa" Chris answered. Taking a last look around his room (situated on the mid-deck of Nana and Papa's flying house) Chris checked to see that it would pass the inspection Nana was sure to give it later. Reassured, he headed for the garden. On the way to the garden, Chris thought back to the events of the last few days. Nana and Papa had arrived in central California two nights ago. Papa usually tried to schedule arrivals for after dark, so as not to draw too much attention to the house. It was cold and raining that night, typical of the central valley in January. Papa set the house down softly in the empty field behind where Chris and Skye lived with their Mom. Of course, hardly anyone knew it was a house; from the outside, it looked a lot like a big blimp. Sure, it had a slightly funny shape, and markings that didn't look quite like the Goodyear blimp, but most folks didn't look that closely. 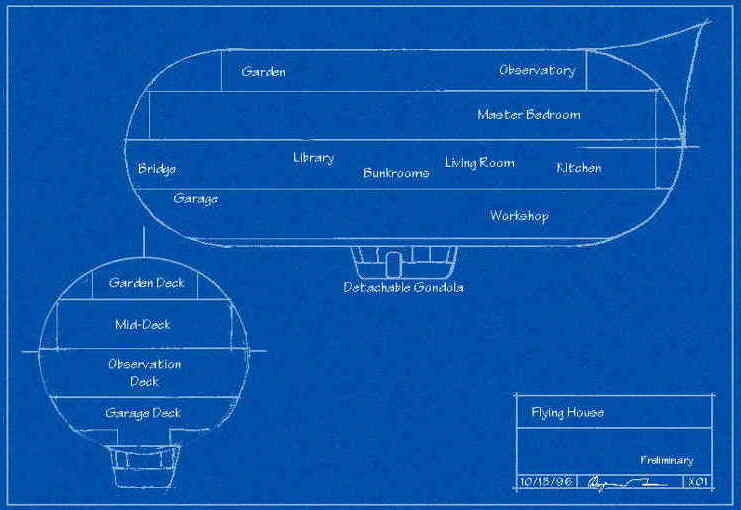 The great thing about it, though, was that it WASN'T a blimp; the big part that would have been a blimp's gas-bag was really living space, divided into three large decks with a fourth slightly smaller deck in the bottom for a garage. Below it all was a gondola ("Have to keep up appearances" Papa said). Chris and Skylar had spent the day gathering up some favorite toys, picking out light, loose summer clothes, and making trips back and forth between their apartment and the field out back. Of course, Mama helped out (even though she wasn't going along on this trip), unpacking summer clothes and helping the boys choose suitable color combinations. "I expect you boys to obey your Nana and Papa" said Mama as she tucked the last of Skye's shirts into the dresser. 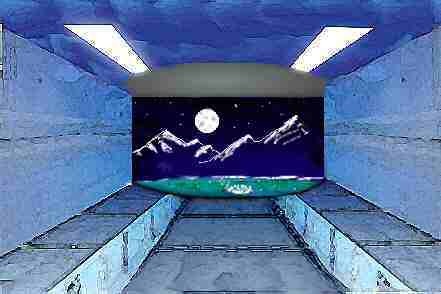 Each boy had a room of his own in the Flying House, a luxury they did not enjoy in their apartment. "OK" said Skylar. "We will, really! really! really Mom!," said Chris, very excited at the prospect of such a big trip. The boy's rooms each had a twin-sized bed with a down-filled bedspread, a desk, built-in dresser, closet, well-stocked bookshelves (C.S. Lewis' Chronicles of Narnia; Bertrand R. Brinley's The Mad Scientist's Club; National Geographic magazines; Hardy Boy's; and on and on...), and perhaps best of all a good-sized window through which to watch an ever-changing view. "You two aren't going to want to come home after this, are you?" Mama said with just a trace of sadness in her voice. Skylar walked over and put his small arms around his Mom. "I love you, Mama." "I love you too, Skylar." "We'll come back Mom" said Chris, trying to cheer her up. "I know" she said "and you'll have lots of stories to tell, and I know that Nana and Papa will take good care of you." The three of them left Skye's room then, walked the corridor to the staircase, spiraled down three decks to the airlock, and exited the House through the secret door in the gondola slung below it. Back in the apartment Papa had just finished re-attaching a towel bar that had come loose. Nana had some lunch waiting in the kitchen. The family joined hands around the kitchen table and Papa gave thanks "in the name of the Lord Jesus to God the Father" for all the good gifts our family has come to enjoy. An excited discussion followed between mouthfuls of food, planning the coming trip. "We expect to be gone about two weeks" Papa said to Mama. "We'll follow pretty much a Great Circle route, with slight modifications to avoid controlled airspace". "How long will it take you to get there?" Mama asked. "About 24 hours" Papa replied. "We're going to take it low and slow, no more than 150 MPH this trip." "The scenery will be great," said Nana, "and I'll be sure the boys learn something about geography." "And geology!" said Papa. "You can see a lot of the earth's structure from the air." After a couple more trips between the apartment and the flying house, the task was done. Both boys had all they needed for a comfortable trip; Papa had done his quota of work around the apartment, and was busy making final preparations for departure in the control room; Nana had seen to fresh linen for both boy's beds. It was time to bid Mama, and central California, goodby for a while. "Wish you could come along" said Nana as she hugged Mama goodby. "Me too," Mama replied, "but I don't have any vacation time saved up right now. Maybe I'll be able to come along on your next adventure." "Goodby" said Papa. "We'll give you a call from time to time." Mama gave Chris a big hug. "See you later" she said. She bent over and picked Skylar up. "You're Mama's big boy, aren't you?" "Yes" he said. "See you later" "See you yater" Skye replied. The sky had cleared somewhat to the west. The house took off right in the middle of a glorious sunset as Mama watched from the back porch of the apartment. Papa had turned on the red and green running lights so that other aircraft would be able to see the flying house and avoid it. The house rose up slowly and quietly above the tallest roof, and then began to move swiftly towards the east. Soon it was just some distant lights in the gathering dusk. Uncle hung up the telephone and let out a deep sigh. It had been a very busy week; one problem after another had telephoned, faxed, or walked in to the family business. Although he had planned to meet up with Nana, Papa, and the grandkids before they left, his plans were delayed. Because he was in charge, Uncle didn't want to leave anything undone. It just wouldn't do to walk away from the office if that meant leaving behind unhappy customers, clients, or business associates. Contract obligations had to be met; deals had to be honored. Taking one last look around the office, Uncle assured himself that everyone who needed to be notified, pacified, mollified, or satisfied, had been. E-mail, voicemail, and all operations had been either forwarded, automated, or shut down for the next two weeks. He could walk out the door with a clear conscience! Vacation time in the tropics lay ahead! Hopping into his DeLorean, Uncle pulled smoothly out of the Tech Innovations parking lot and headed towards the outskirts of town. As he drove further and further from the population center, he reviewed in his mind the preparations of the night before. Quite simple, really; a couple of personal items and a few favorite outfits; his SeptiMax Notebook computer; and the newest Landover novel. Everything else he might need was in his fully-furnished private apartment on board the Flying House. The cross-streets finally let out into a winding road headed up into the hills. He hadn't noticed anyone in his rear-view mirror for the last five minutes. There was no sign of oncoming traffic. Uncle pressed the ACTIVATE key on the console display. Headlights and taillights winked off, suddenly replaced by red and green running lights. The customary purring sound of a simulated V8 engine was replaced with a barely audible hum. The DeLorean smoothly lifted up off the roadway and into the starry night sky. Chris and Skye, looking through windows on one of the observation decks, had watched their apartment fall away below and behind. They waved to Mama until she was completely out of sight. Then they headed down the hallway, Skye following his big brother, and joined Papa in the control room to see what was up. "Hi guys!" said Papa. "Where have you been?" "Waving goodby to Mama" said Chris. "What are you doing, Papa?" "Well," said Papa, "I've been busy getting us under weigh and setting up the auto-pilot so we'll have a safe and comfortable trip." Papa was sitting in a large captain's chair right in the middle of a room full of windows. You could see everything there was to see forward and up and below and to both sides; kind of like the view from the flight deck of a sightseeing helicopter. Far below the boys could see the lights of scattered farmhouses. Highway 99 looked like a stream of white headlights going one way and red taillights the other. Here and there they could see a golden light marking the location of the pumping stations which moved water to the vast crops of California's central valley. Papa bent over slightly to take a closer look at the computer video screens in front of him. Scenes from behind, from either side, and from directly above and below the flying house were visible; there were also displays a lot like the radar screens you might see in the movies, with little pictures of airplanes moving across them. There was even a picture like you might see on a TV weather report showing clouds moving across a map of California and Arizona. "Everthing is clear ahead of us for at least two hundred miles" Papa announced. "How can you tell?" asked Chris. "Look at this radar screen" said Papa. "We are in the center; the way I have it set now, each circle moving out from the center means 50 miles of distance; there are three circles and then comes the edge of the screen, which makes a total of 200 miles. I see no traffic in front of us at this altitude." Chris could see on the radar that what Papa said was quite true. "Oh, I get it" he said. Then he looked a litle closer. "What's this yellow dot coming up behind us?" "Just a minute, I'll check." Papa clicked on the dot, and then clicked on an icon labeled "IDENT". The dot turned green and next to it a string of numbers appeared. Papa smiled. "I thought so. That's your Uncle Chris on his way to meet us." "Uncle?" said Skylar. "Where's Uncle?" "Right here." Papa pointed to the green dot, now rapidly moving toward the center of the screen. "That's not Uncle!" Skylar sounded indignant. "Yes it is," Papa replied, "and we should be seeing him very soon now." Papa clicked on another icon labeled "COMM" and then one marked "SECURE". "This is the Mother Ship calling. We see you on our screens. Over." Suddenly Uncle Chris's voice came over the speakers. "I read you, Mother Ship." "Good evening, Uncle. You have two rather surprised nephews here watching you. Shall we give them a good show?" "Sure thing; what do you have in mind?" "How about Jonah and the Whale?" "Roger that; see you in about five." "Roger, over and out for now." "What are you talking to Uncle about, Papa?" Chris asked. "You are about to find out; just keep watching out the front window and on this screen." Papa clicked once more on the green dot, which was now very close to the center of the screen, and selected "Remote Video, Front". The radar screen disappeared and in it's place the boys could see an image of the flying house from behind, growing larger and larger in the screen. "You are seeing what Uncle is seeing from his car" Papa explained. When the house had almost filled the screen, the viewpoint dipped down and the flying house disappeared from view overhead. "Look out the front window, now" Papa said. "Look downward." The boys strained to see. Suddenly a car flew into view. They could see Uncle Chris at the controls. The car moved out ahead of the flying house. Papa clicked on the screen again, and selected "Remote Video, Rear". The screen view changed to show the front of the flying house, just what Uncle could see in his rear-view mirror. As they were watching, a large door began to open below the flight deck where they were seated. "Uncle has activated the garage door opener" Papa said. Looking out the front window, the boys could see Uncle's car begin to move slowly backwards towards them. He disappeared from sight beneath their feet. They heard some noises and felt a slight bump. "Uncle's home" Papa said. Slipping the remote unit into a shirt pocket, Papa left the house on autopilot while he and Skye and Chris walked through the hallway and then down the staircase to the garage deck. Uncle was just closing the trunk of his car. The car was a highly modifed stainless-steel DeLorean; Uncle's choice of car to add flying capability to, in honor of the "Back to the Future" movie series. "Hi Uncle!" Chris and Skye called out in unison. "Hi" Uncle smiled back. "How are you guys doing? Hi Dad!" "Hi Son!" smiled Papa. "Any trouble getting away for this little adventure?" "Just a bit" Uncle replied. "I had intended to meet you last night before you left, but wound up having to work late taking care of the business." "Well, I'm glad you're here" said Papa. "I think you'll enjoy seeing where I grew up, and besides, I won't say much about the 'shakedown' cruise on the way back." 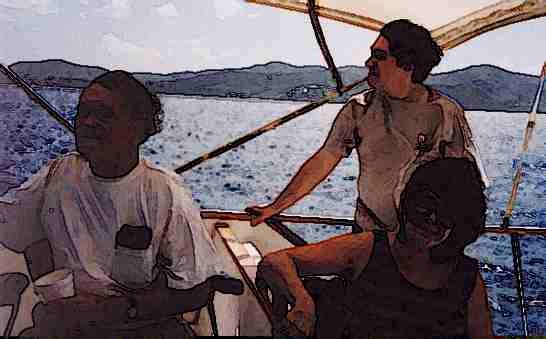 "What's a shakedown cruise?" asked Chris. Papa supplied his standard, very frustrating answer; "You'll see." "Aw, come on, Papa - why won't you tell me?" "This way if it doesn't work out, you won't be disappointed" Papa replied. It was solidly dark now, and the Flying House had almost reached the Continental Divide. "We need to refill our water tanks" Papa announced. "I think there's a mountain lake coming up ahead. We'll stop and let down a hose." Sure enough, the boys could see the glint of moonlight on water through the front windows. There was a fair-sized lake nestled in a mountain pass almost straight ahead. 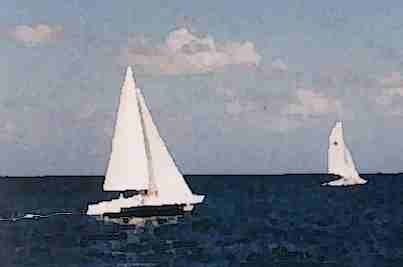 Papa steered the house in that direction and began to both slow down and descend toward the surface of the water. When the house was about 30 feet above the lake, Papa stopped all motion completely. "Let's go fill 'er up!" he said. "Yay!" exclaimed Skylar. "Let's go!" and with that he ran down the hall toward the stairs. Papa laughed. He knew that Skye wouldn't be able to get into too much trouble even if he got downstairs before everyone else. The most important house controls, like door-opening and flight functions, just wouldn't respond to the commands of a four year old, especially when the house was in flight. Papa, Uncle, and Chris arrived on the garage deck in time to watch Skylar trying to open the airlock. "I can't open it!" he announced, his small voice filled with frustration. "Help me, Papa!" "That's OK Skye" Papa said, "we're going to use the big door in front." He strode past Uncle's DeLorean and to the big doors in the nose of the garage. Taking the remote unit from his pocket, Papa punched in a rapid key sequence. 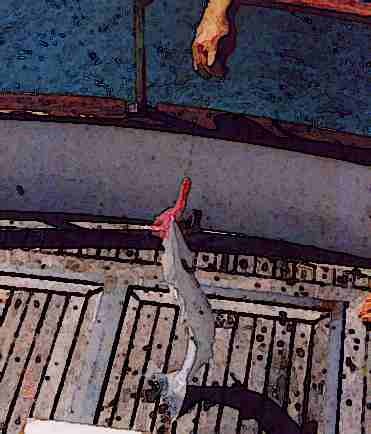 Chris heard the whir of hydraulic pumps and as he watched, the big door began folding inward and upward. There was a momentary breeze as the greater air pressure inside rushed outward into the thinner mountain atmosphere. For a moment, all four men, from the oldest to the youngest, stood transfixed at the beauty of the scene before them. The peaks around the lake were covered with dazzling snow, glittering in the light of the full moon. A mild breeze stirred the surface of the lake 30 feet below, causing reflected moonbeams to dance on the open garage door overhead. "Give me a hand, Uncle" said Papa, breaking the spell. He stepped to a cabinet on the left side of the garage. Opening it, Papa reached in and began to unreel a good-sized hose with a cylinder on the end about the size of a loaf of bread. There was a filter screen covering the open end of the cylinder. He handed the end of it to Uncle, saying "Let this down over the edge of the open doorway while I unreel it and feed it out to you." Uncle took the end of the hose, which had a filter screen attached to it, and walked it over to the edge of the open garage bay door. There he carefully lowered it over the edge and down toward the water, a little bit at a time as Papa unreeled the hose from the cabinet. "What's that thing on the end? How far down does it have to go?" he asked. "That's a Chancellor Pump" Papa replied. "Just lower it, oh, three or four feet into the water should be plenty" Papa replied. "I would like it to be far enough beneath the surface so it won't pick up any flotsam adrift on top." "OK, then, we're almost done" Uncle said. "The end's already in the water. I just need a couple more feet." Papa paid out two more feet, and then an extra bit for good measure. "That should do it" said Uncle. "Now what?" "Just loop this bungee around the hose and lash it to the tie-down point in the deck near your foot." said Papa, tossing Uncle an elastic cord. "Then we turn on the pump, and wait for the tanks to fill." As soon as Uncle had the hose secured, Papa threw a switch in the cabinet. The boys heard the powerful pump start with a whirring sound. The hose quivered quite a bit at first, but then steadied as water filled its entire length. "We're in business!" Papa said. While the water gathering operation was in progress, Papa showed Chris and Skylar the Flying House's water tanks. They were built into spaces along both sides of the house's garage deck, tucked into what would otherwise have been wasted space where the hull curved down to the floor. In about fifteen minutes, the water level indicators met with Papa's approval and he turned off the pump switch. "OK, now unhook the bungee and we'll pull the hose up." he said. "I'll do it! I'll do it!" Skylar hollered. He took off like a shot running toward the spot where the hose curved over the edge of the open garage door. Before Papa could react, Skye reached the hose; but he was moving too fast! To everyone's horror, he tripped and flew, head-first, right over the edge! By this time, Papa was already in motion, shouting orders. He pressed the remote into Uncle's hand, saying "You drive! ", just as the sound of a big splash came from below. "Chris, run get some blankets!" he shouted while hitting a switch on the wall. A powerful floodlight came on, illuminating the water below. Papa was pulling off his shoes and sweater, looking frantically over the edge. A ring of ripples spread out from a spot in the lake near where the hose entered the water. Papa took careful aim just beyond, and dove in. The beeper on the oven sounded, and Nana slipped on her oven mitts. The brownies were done, and it was time to start supper. She set the pan on the counter top to cool, closed the oven door, and put the mitts back in the drawer. Nana had been working on a crosstitch pattern for a quilt square for one of the ladies at church who had recently had a baby. It was a picture of a toy train and some blocks, stitched in the colors chosen by the new mother. Alongside was the Bible verse, "Train up a child in the way he should go". The quilts were a church family tradition, sure to be treasured for generations. Just as Nana began looking through the pantry to choose a meal, Chris came racing madly through the kitchen on his way to the linen closet. "What in the world is that boy's hurry?" Nana thought. "Those men must be up to something down there; I'll just ask Chris what's what. Nana stepped out of the pantry to see where Chris had gone. She could hear him now, running back down the hall. "Chris!" she called as he passed the kitchen again. Her curiosity turned to annoyance when Chris simply ignored her and sped on towards the stairs. The nerve of that boy to ignore his Grandmother like that! Nana wiped her hands, took off her apron, and headed towards the garage herself. She was determined to find out what was going on. Chris was in for a reprimand! Suddenly finding himself sailing through the air, poor Skylar had been too startled to yell; when he hit the ice-cold water, the shock of the cold made him automatically hold his breath. He popped to the surface just as Papa was plunging in a few feet away. By now he had had enough time to be scared, so he yelled, and wound up choking on some water. By the time Papa reached him, Skylar was in a panic. Papa grabbed him from behind, wrapping one arm around his chest, held his head above water, and swam toward the hose. Uncle had already lowered the house so that the open garage bay door was now only six feet above the lake. Papa reached the hose and held on. Skylar had started crying, which, surprisingly, made Papa feel quite relieved! If Skylar was crying, that meant that he was breathing! "You're going to have to bring it down a little farther" Papa shouted up to Uncle. "Don't worry about that right now - it'll dry out. Just bring it down another two feet." Rather than answer, Uncle worked the controls and the house came down, forcing the base of the gondola into the lake. "Now reach down and grab him" Papa said. Setting down the controls, Uncle lay down on the garage floor, stretching both arms over the ledge as far as he was able. Papa boosted Skye, dripping wet, up along the hose. "Skylar, reach up to Uncle!" Papa said. Skylar stretched out a hand, which Uncle grabbed, pulling him up and over the ledge. Then Papa pulled himself up along the hose, over the edge, and collapsed in a puddle of cold water on the garage floor, trying to catch his breath. Uncle grabbed the remote and in a moment the house rose up above the lake, allowing the water to begin draining out of the bottom of the gondola. Just then Chris came running downstairs with a couple of blankets. "Is Skye OK?" he shouted. "You're just in time!" Papa managed a weak smile. He immediately began to take the freezing wet clothes off of his youngest grandson, and then he wrapped him in one of the blankets that Chris had brought. "It's OK, Skye, are you OK?" Papa hugged him and tried to comfort him. "I'm cold, Papa!" Skylar managed to get out. "I fell down!" He started to cry again. "There, there, it's OK Skylar" said Papa. "I know you were trying to help me. I'm sorry you fell and were scared. You're OK now." Looking at Uncle, Papa said "Nana doesn't have to know about this, does she?" Just then Nana came bustling down the stairs into the garage. "Know about what!" she said, beginning to be alarmed. Then her eyes took in the soggy scene, and opened wide in alarm. "Papa, what have you done!" she almost yelled. "It's alright now." Papa replied, and then started to say "Skylar tripped and fell into the lake..."
When Nana heard that, she got really upset and started yelling. "What! He could have drowned! And that lake must be as cold as ice! You two are bound to catch your death of colds!" "Now, now," said Papa, "instead of yelling, why don't you go make us some chicken soup. I'll take Skye up for a hot shower, we'll have something hot to eat, and then get a good night's sleep. We'll be in tip top shape by morning!" Papa started peeling off his wet clothes so he could wrap the other blanket around himself. Realizing the sense of Papa's request, Nana turned and headed for the kitchen, muttering something like "It's a good thing angels don't mind working overtime..."
"Uncle, would you please close up down here and get this ship back on course for St. Croix?" Papa said. "And, Chris, please wring out our wet clothes and put them in the laundry basket while we go get a hot shower." Suddenly, everybody was busy doing what needed to be done. After all the excitement, filled with hot soup eaten in front of a fireplace, nobody had any argument when Papa announced that it was bedtime. Chris stopped daydreaming about yesterday when he walked into the garden. Nana had the patio table set with a lavish breakfast. Nana, Papa, Uncle, and Skye were already seated and eating. "We went ahead and started without you" Nana said. "You were just taking too long to get here." "Sorry, Nana" Chris replied. "I guess I was just daydreaming a little." "That's OK" smiled Papa. "I'm sure you have a lot of new things on your mind. Just say your own prayer, and then dig in!" Chris sat down at the table with the rest of the family. Through the windows to the north he could see a thin stretch of land across the water. As he buttered his bagels, he asked "What's that land over there?" "That's Key West, Florida" Uncle replied. "Oh" said Chris around a mouthful of breakfast. "We'll be passing Cuba next" said Nana, "then Haiti and the Dominican Republic, and then finally Puerto Rico just before St. Croix." 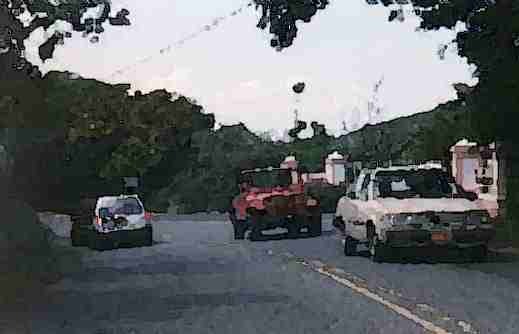 St. Croix is not like most places you might know. For example, people who drive there must drive on the LEFT side of the road, not on the right side. If you aren't used to this, you might find it surprising. If you are the one driving you have to think pretty carefully and quickly, especially when you are making a turn across other traffic. Skylar was too young to notice the difference, but Chris thought it was really wierd! "This is scary!" he said as they went around a corner. "At least the drivers here aren't as crazy as they are in Puerto Rico!" Nana exclaimed. One day, Uncle Gene offered Papa the use of his Model A replica roadster. What a fun car! It had a convertable roof, an old-fashioned horn that made a sound something like "AAH-OOHH-GAAA", and an open-air rumble seat in the back. Papa, Uncle, Aunt Sue, and Nana climbed in. 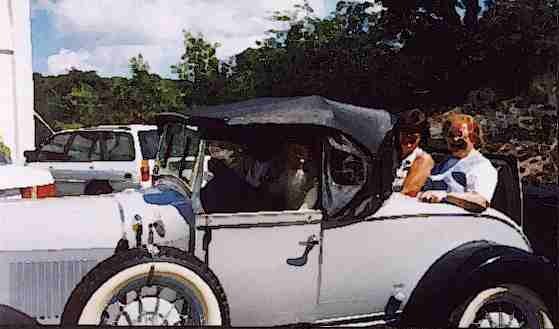 Nana and Aunt Sue sat in the rumble seat. Off they headed to the south shore to see Great Grandpa at his work. Along the way, they drove past the ruins of some old Danish mills. 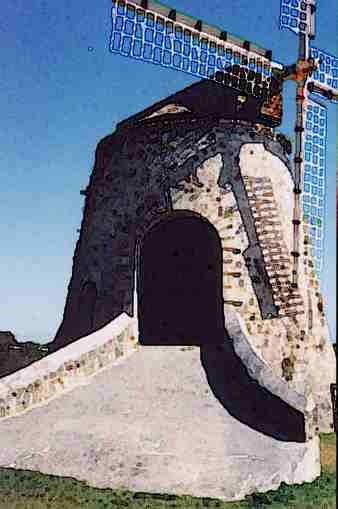 St. Croix is covered with ruins of many kinds of mills. These were built during the time when Denmark owned the island. This mill was once used to process sugar cane. This mill was once used to pump drinking and irrigating water up from beneath the earth. This mill has been partly restored - you can see the blades which were once covered with fabric sails to catch the wind. Uncle Gene has a mighty fine cabin cruiser. 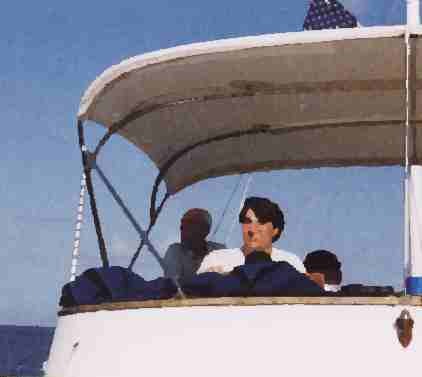 One day we took a trip to Buck Island. On the way over there, Uncle Gene said to Uncle "I need a break. You drive this thing for a while. This suited Uncle just fine. "Hey Uncle!" said Chris. "Now you're the Captain!" Uncle just smiled, and kept the cruiser on a steady course. As he looked around for traffic, he noticed some sailboats coming up behind. They seemed to be racing toward Buck Island. Soon, they were passing us. We just kept following them toward Buck Island. 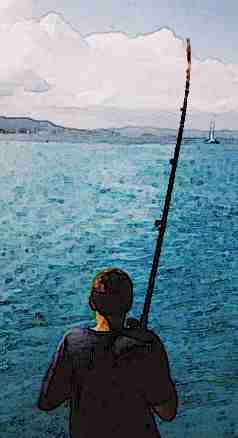 Chris got out a fishing pole and let out a line over the stern of the boat. Pretty soon he yelled "I think I've got something!" Sure enough, he pulled up a good one! Pretty soon, Uncle said "I think we're getting pretty close. Uncle Gene, are you ready to take over again?" Uncle Gene said "Sure" and took the helm. On the way home, both of the pilots from the trip out just relaxed; Papa and Great Grandpa handled the boat. Final goodbyes were said all around; there were hugs, and not a few tears at the prospect of being separated again for a time. Aunt Sue, Uncle Gene, and Great Grandfather were gathered between Aunt Sue's parked car and Great Gradfather's truck, waiting to watch us depart in the flying house. Evening was fast approaching. The shadow from the bluff to the west of the bay where the house was parked had already extinguished the brilliant turquoise of the sandy patches between coral heads. Papa was busy running system checks to be sure that the house was ready for the return trip home. Uncle was occupied with some screens and controls that, up until today, Chris had not seen. "Uncle, I know what Papa is doing, but what are you up to?" Uncle seemed to ignore Chris for a moment or two as he finished a keyboard entry. He peered closely at the screen to be sure his command had taken effect. Apparently satisfied, he turned to Chris and began to explain. "We are taking a kind of 'shortcut' home." he began. "But I thought we came straight here. Papa said something about a big circle.."
Uncle chuckled. "That's 'Great Circle'" he corrected gently. "Yah, great circle, that's what I meant - Papa showed me on a globe map." Chris looked puzzled as he asked "How can we take a shortcut home if we already took the shortest route to get here?" "We can't take a shortcut in distance; but we can take a shortcut in time." "I still don't get it!" Chris seemed frustrated. "We are going to follow a different path home" Uncle continued. "I've been busy checking air traffic control networks for flights passing overhead from this location, even flights at very high altitudes. I've also warmed up the radar and aimed the long-range antenna upward." By now, Papa had finished his system checks. "Everything looks nominal." Papa said to Uncle. Turning to Chris, he said "We're about to leave here at high speed, headed almost directly upward. When we are above most of the atmosphere but still below the level of orbiting satellites, we'll head for the Pacific. Without the thick layer of air to slow us down, we'll get home far faster than we got here." It took a few moments for Chris to realize what was about to happen. Then he burst out "You mean we're going to outer space?" Uncle smiled. "Depends on your definition of space. We'll be about 60 miles high for most of the trip, and some folks would say that space doesn't begin for another thirty miles or more. I'd say that it's close enough to being outer space that you sure wouldn't want to step outside in your T-shirt." "Wow! Wait 'til my friends hear about this!" "You might not want to tell anyone" Papa reminded Chris with a wry grin. "They may just think you're telling tall tales." Uncle had more to say. "There's another factor we took into account when we planned our trip. Because we'll be above the atmosphere, we won't be protected from meteors. However, we are almost exactly halfway between the Quadrantid and Lyrid meteor showers, so we don't expect anything more than a random micrometeor. One that small shouldn't do much more than leave a small pit in the hull. Anything large enough to break through the outer skin should be stopped by the hull insulation. Only a rather large meteor would be able to penetrate both outer skin, insulation, and inner skin; but to be on the safe side, we just won't venture up to the garden deck while we're at altitude." The sun had set completely by now, and the rapid fall of a tropical night already revealed many of the brighter stars in the sky overhead. "Are we clear for departure?" Papa asked Uncle. "All clear forward and up" Uncle replied, "no traffic anywhere in range." "Then we're off!" Papa exclaimed, "and besides that, we're leaving! Everyone brace for acceleration!" This last command was broadcast throughout the house. Nana and Skylar, who were preparing supper in the kitchen, set down their utensils. "Hang on a minute, honey" Nana said to Skylar. Papa brought his finger down decisively on his control keyboard. Without a moment's hesitation, the flying house began moving smoothly upward, rapidly increasing in speed. To Chris, it felt like the fastest elevator ride he had ever been on; had he been standing on a scale, he might have seen that he now weighed 85 pounds instead of his usual 80. This was because the flying house was accelerating upward at a rate of two feet per second per second, adding an extra force to the usual effect of gravity. The relatives waving at them from below seemed to fall away. Within moments, they were almost impossible to see. 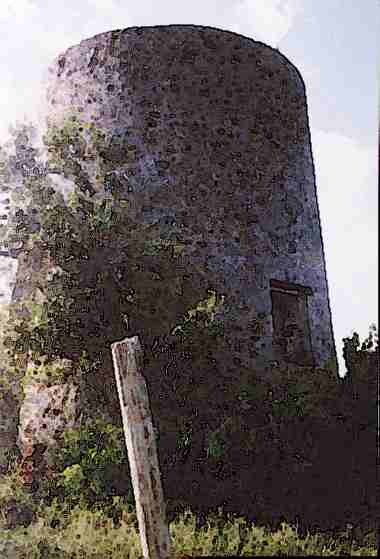 Lights from Christiansted were now in view, followed soon by the flashing lights to the south marking the location of Hess Oil. Frederiksted was obscured by clouds. "I feel heavy, Papa" Chris said. "Of course you do, Chris. Let me explain what's happening. The flying house is moving upward very quickly, but the mass of your body wants to stay behind on St. Croix. We call that 'inertia', one of the properties of matter." "Nothing's the matter" Papa replied with a straight face. "Stop teasing me!" said Chris. "Okay", Papa relented, "matter is what your body, and everything else, is made out of. You might just think of it as 'stuff'. All matter resists changes in its speed and direction. That resistance is called inertia, and that's what is making you feel about 6% heavier right now." St. Croix was already completely visible below their feet, outlined by moonlight glittering on the Carribean which surrounded it. "How long will it take us to get to space?" Chris asked. This time Uncle replied. "If we kept moving straight upward, we would be there in about ten minutes" he said. "But we aren't going to go exactly straight. As we climb, we are gradually tilting toward the west." By now, St. Croix had disappeared below and behind. Ahead of them the island of Puerto Rico could be seen. "It will take about two more minutes to reach 60 miles altitude because we're following a curved path to get there; but by the time we do, we'll already be past Puerto Rico and picking up speed toward home." Papa picked up the story here. "We will increase our tilt just enough so that between our acceleration and gravity, our weight will seem to stay the same. Instead of continuing upward, though, we'll reach a very high speed to the west. About half way there, we'll reverse the process. 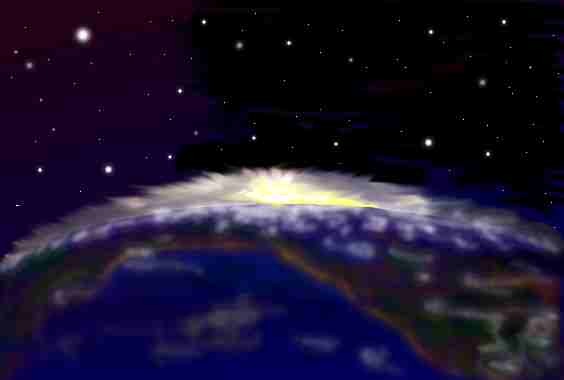 By tilting back the other way, our thrust will slow us down and allow us to drop back down toward Earth. By the time we are back to the 1500 foot level, we'll be moving slowly again like a blimp; but we'll have a much shorter distance left to travel to take you guys home." Just then Nana and Skylar walked into the control room carrying a large tray. "Here's your supper, boys. Can you take a break and eat?" She set the tray down on a table at the back of the control room. "Thought you and Sky would never get here!" said Uncle. He walked over to the tray, picked up a sliced french roll, and began applying coldcuts, cheese, sliced olives, and shredded lettuce. By the time everyone had made a sandwich and started to eat, the flying house was as high as it was going to get and had passed by Puerto Rico. "How fast are we going, Papa?" "About 1200 miles per hour." "Wow! I've never gone this fast before!" Uncle broke in. "Before we start to slow down, we'll be moving at almost 4000 miles per hour. We'll be most of the way home in less than two hours." By now, the flying house had "leveled off"; that is, it was no longer climbing. However, it was still accelerating. In order to keep this comfortable for everyone, the computer autopilot held the whole house tilted just the right amount in the direction toward which they were flying. To everyone in the house, it just seemed as though the world below was slightly tilted, like a never-ending uphill slope. It was beginning to get lighter and lighter ahead of them. "We are about to see something that very few people have ever seen, including most astronauts" Papa announced. Just then, the sun appeared over the horizon. "Sunrise in the West!" Papa exclaimed. Because the Flying House was moving westward faster than the earth spins toward the east, they had caught up with and begun to overtake the sun. In fact, it looked as though it were rising faster than you would see it rise on any normal day. The windows of the house had adjustable polarizers built in, and Papa adjusted them so that the glare of the sun wouldn't be too strong in everyone's eyes. Be sure to check back from time to time until you find the next story in the Travels in the Flying House series; "Nana and Papa Visit the Moon".